Some 400 officers from the Free Syrian Army (FSA) concluded a three-day conference in Turkey’s Hatay province bordering Syria with a decision to close ranks and combine the disparate FSA offshoots under a unified command. Abdel Qader Saleh, who leads the Tawheed Brigade and heads FSA military operations in Aleppo, made the announcement yesterday. 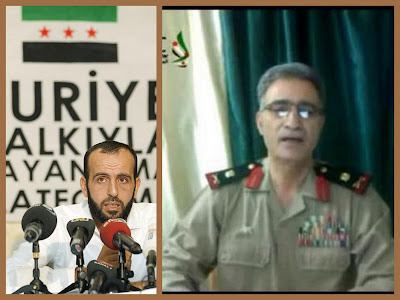 Key officers attending the three-day huddle included Col. Riad Asaad, founding commander of the FSA; Col. Qassem Saadeddine, FSA spokesman on the ground inside Syria; Maj. Gen. Adnan Nawras Salou, head of the Joint Military Command Council for the Syrian Revolution; and FSA Military Council head Gen. Mustafa al-Sheikh. The assumption is that the restructured FSA will henceforth come under the wings of the newly formed “General Command of the Syrian National Army.” Or will it? Maj. Gen. Mohammed Hussein Haj Ali will head the Syrian National Army, which becomes the Syrian Revolution’s military arm. Gen. Haj Ali, the revolution’s new military top dog, hails from Hauran in southwest Syria. He was born in Khirbet Ghazaleh, Deraa Province, in 1954 and headed Syria’s National Defense College since 2008 when he defected to the opposition in early August. He is a Public Administration graduate of Damascus University, attended the former Soviet Union’s V. I. Lenin Military Academy in 1984-85 and holds a PhD in National Strategy from Egypt’s Nasser Higher Military Academy.